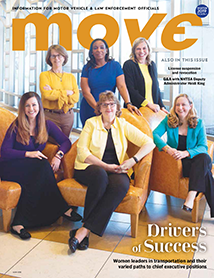 Chair of the AAMVA Board of Directors, Rhonda Lahm, has gotten her tenure off to a busy start. After officially taking the position on at the 2018 Annual International Conference in Philadelphia, she has had several months full of meetings and conferences, travelling all across North America. We caught up with her while she was in Arlington, Virginia at the Combined Standing Committees Meeting, to ask about how she got involved in the AAMVA Community and what she hopes to accomplish as Chair. 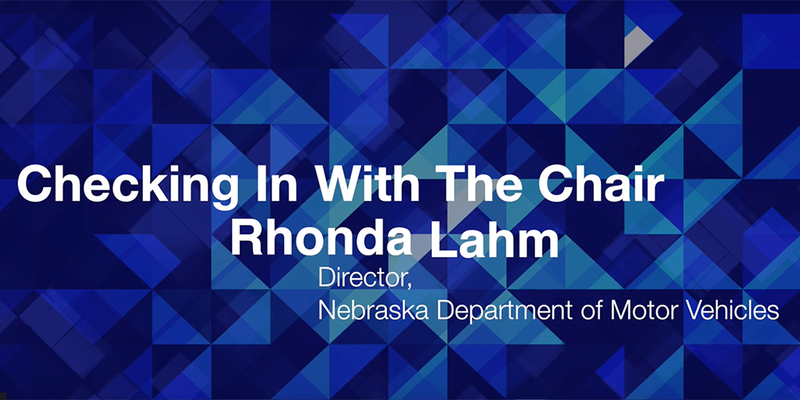 Though she has plenty to keep her busy both in Nebraska and on the road as Chair, Lahm enjoys many different activities during her free time. “When my schedule permits, I like to hop in the car and drive down I-35 to Texas because that’s where my two granddaughters are – ages 2 and 5. Being 900 miles away, I don’t get to see them as often as I’d like,” she says. “I also like scrapbooking, that’s the thing I do to give me ‘me’ time. My perfect Saturday is scrapbooking all day and watching college football.” She says she also enjoys baking and is looking forward to the holiday season when she can show off her talents. “I’ve been known to use my employees as guinea pigs when I try new recipes – so far they haven’t complained,” she jokes.